Kilchberg, August 19, 2014 – Lindt & Sprüngli has made a successful start into the financial year 2014. Sales and profit growth in the first half of 2014 was once again well above the market average. This led to further market share gains in all important markets and strengthened accordingly the company’s already leading position in the premium chocolate segment. The acquisition of the US family business Russell Stover/Whitman’s, announced on July 14, 2014, is clear evidence of Lindt & Sprüngli’s determination to expand its position in North America and further enhance its already substantial contribution to the dynamic growth of the premium chocolate segment in the world’s biggest chocolate market. In response to the good overall progress of business and the accompanying above-average volume growth, considerable further investments have been made to expand the capacity of the production facilities in Switzerland, Germany, France, and the USA. The first half of 2014 saw a further slight improvement of the general economic background in most countries. Early signs of stabilization have even been observed in Southern Europe, but this has not yet been fully reflected in consumer sentiment. The strong pressure of competition in the retail trade and the sustained weakness of a number of foreign currencies against the Swiss franc continue to be very challenging. The same applies for the raw materials sector, where the prices of almost all the commodities that are important for the chocolate business stepped up further, in particular cocoa beans, cocoa butter, milk, and nuts. In view of this upward trend, Lindt & Sprüngli, alike other companies, had to make occasional price adjustments on selected products. The Group’s already sound position in the key European markets of Germany, France and the U.K., as well as Switzerland, became even stronger due to above-average growth rates and further market share gains. Good progress has also been reported in Italy, although sales in the traditional distribution channels are still under pressure. On the other hand, growth of business in the modern Italian retail trade is proving very satisfactory. In North America, Lindt & Sprüngli achieved organic sales growth of 13.7% with its LINDT and GHIRARDELLI brands, and is not only continuing to grow considerably faster than the overall chocolate market, but is even outperforming the general trend of the dynamic premium segment. All three North American subsidiaries in the USA and Canada reflected this very positive development. Following the acquisition of Russell Stover/Whitman’s, an American family business with a long-standing tradition, Lindt & Sprüngli gains momentum in the path of geographical expansion. This, the biggest and strategically most important acquisition in the company’s history, strengthens Lindt & Sprüngli’s clear leadership in the American premium chocolate segment and consolidates its status as the third-largest manufacturer in the USA, the world’s biggest chocolate market. Lindt & Sprüngli holds a 51% majority interest, is a clear sign for Lindt & Sprüngli’s long-term commitment to the world’s fifth-largest chocolate market and to its ongoing expansion into new and fast-growing emerging countries. The sales performance of the worldwide Lindt & Sprüngli retail network continues to report a highly dynamic growth, gaining 19.3% in the first half of 2014. Amounting to some 10% of Group sales, the “Global Retail” Division has become a mainstay of the business model and makes an ever-growing contribution to Group-wide sales. In the LINDT Boutiques and Chocolate Cafés – especially in the new emerging markets – the extensive product range is presented effectively to consumers. At the same time a unique shopping experience is being created, generating long-lasting brand awareness and close customer ties. For this purpose, new LINDT shops were newly opened at prime locations in the first half of 2014. A special highlight was the inauguration of the LINDT “Swiss Chocolate Heaven” by LINDT brand ambassador Roger Federer on the Jungfrau. The spectacular opening event with an exhibition tennis match between Roger Federer and the US ski champion Lindsey Vonn generated global media interest. Year after year, the new LINDT Experience Shop will now sweeten the excursion to the “Top of Europe” (3,454 m above sea level) for nearly one million tourists from all over the world. This will generate an unforgettable afterglow of the LINDT brand in the minds of the primarily Asian guests. Lindt & Sprüngli is aware of the national and international importance of the Swiss chocolate industry and is therefore actively committed to safeguarding Switzerland’s long-term importance as a worldwide center of chocolate manufacturing. With that aim in mind, the LINDT Chocolate Competence Foundation was set up in 2013 with a view to broadening professional expertise and knowledge in the field of chocolate. The widely acclaimed “Swiss Chocolate Adventure” multimedia experience world in the Lucerne Museum of Transport was established thanks to the financial support of the foundation. It was opened in mid-June 2014 and gives the general public an information platform covering all aspects of Swiss chocolate. As at June 30, 2014, Group sales reached CHF 1.2 billion. This represents a gain of 6.0% in Swiss francs and organic growth in local currencies of 9.2% against the first half of 2013, and has been accompanied by the gain of further market shares. 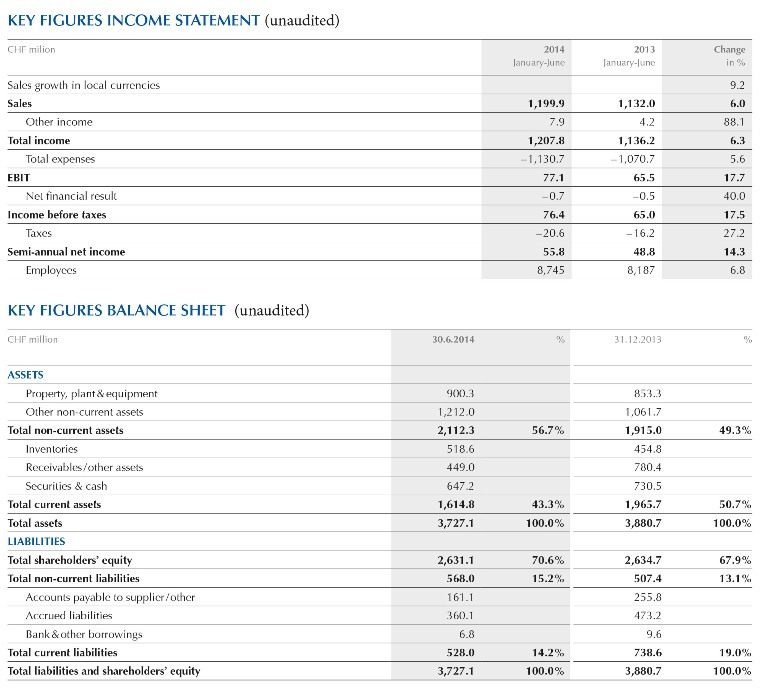 As at June 30, 2014, the operating profit (EBIT) stood at CHF 77.1 million, equivalent to growth of CHF 11.6 million or 17.7% on the comparable period of 2013. After deducting income taxes at the increased rate of 27.0%, the Group’s net income of CHF 55.8 million for the first half of 2014 was also higher than in the same period of 2013. In comparison with the previous year’s figure (CHF 48.8 million) this represents an increase of CHF 7.0 million or 14.3%. Outlook – Excluding the anticipated pro rata contribution to sales and income of the newly acquired, American-based Russell Stover/Whitman’s company, Lindt & Sprüngli is confirming its medium to long-term strategic performance targets for the year as a whole and forecasts organic sales growth of 6 to 8%. The EBIT-margin will be 20 to 40 basis points higher than in the previous year, well within the target range.